Ciboney Group Limited (CBNY) for the nine months ended February 28, 2018 reported Financial income for the period increased by 1151% to total $1,676 million up from the $134,000 reported for the comparable quarter in 2017. Financial income for the quarter amounted to $1.66 million, a gross increase of 5836% relative to the $28,000 reported for the same quarter in 2017. An exchange loss of $103,000 was realized for the period relative to $159,000 gain for the corresponding period in 2017. Other expenses for the period totalled $5.78 million, relative to $3.43 million in 2017. As such, group operating expenses totalled $5.88 million for the nine months ended February 28, 2018 relative to $3.27 million reported for the corresponding period in 2017 an 80% increase. Notably, the Company reported a gain from the sale of property amounting to $182.24 million and reported a total of $74.45 million for debt forgiven for the period under review. Consequently, the Company reported net profit of $252.48 million, a surge when compared with the loss of $3.13 million reported in 2017. Net profit per share was 46.24 cents for the nine months ended February 28, 2018 (2017: loss per share of 0.57 cents). The trailing twelve months earnings per a share is $0.46 cents. The number of shares used in the calculations is 546,000,000. 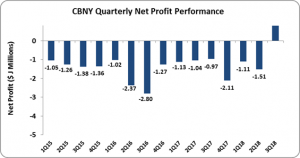 CBNY stock price closed the trading period at a price of $0.12 on April 6, 2018. Total current assets as at February 28, 2018 amounted to $205,896, up from $54.97 million as at February 28, 2017. The main contributors for the growth in total asset was a surge in cash and cash deposits to $200.10 million. Shareholders’ equity amounted to $204.82 million, an increase relative to the $47.66 million deficit reported in 2017.As such, the shareholder’s equity per share stood at $0.37 as at February 28, 2018 (2017: shareholder’s deficit $0.08).